Met a crystal skull today, Skully. The skull had a yellow tint with cloudy white inclusions and 3 small black areas that looked like gnats trapped in amber. Skully was life-sized and heavy. Even though it was mostly hollow, with deep eye sockets and a cylindrical space in the center, it was heavy enough on my legs that I worried about capillary compression. I meditated with Skully for 15 minutes, feeling grief and bliss. I brought my amethyst grotto with me, to charge it up. When I introduced them, the grotto said to Skully, "Yeah, you're old. I'm old too." And to me, "I can do the same thing. Meditate with me." That's right. 12,000. According to Wikipedia. Only a few are fiddleheads, again, according to WikiP. Evidently it's the ostrich fern here in Maine. Steam for twenty minutes. Had to research the fiddlehead, it's a family-of-origin thing. Spent the day in Farmington. Started with a 3 hour committee meeting. Missed my yoga classes. Went to the vet, where Fluff had a venipuncture, injections, and attention to certain glands which I will not describe. Mailed a book to my new marketing whiz and baby things to prospective parents. Wish I'd remembered to take the scrap of paper out of the package of baby things. It was a list of esoteric websites dealing with the ascension. Yeah, they're going to wonder why I included that. Sorry! Took a long walk beside the river: Fluff & me. Thought she could process her stress hormones and feel free. We saw people harvesting fiddleheads. Do you know fiddleheads? Ever eaten them? They are a spring delicacy from Maine. Fiddleheads are tiny tender fern shoots. They grow beside the river. It is one type of fern, and I suppose there are many types. Hundreds? Anyway, you steam them til al dente and eat with butter and vinegar. yum. Fiddleheads are really good in quiche. Then I had a massage, at a place beside the river. There were giant crystals in the room, turkey feathers, and a fountain. She found all my stress points. It felt like five minutes, but it was 90. How did that happen? Afterwards I was so relaxed I felt blind, and had to look in the mirror to see if my eyes were still there. They were. Then I came home and moved my 10 raspberry canes. I'd planted them in inappropriate locations. Too wet, too formal... I moved them into a raised bed, and planted peas between the canes. Now all I have left is 1 1/2 raised beds and LOTS of seeds: carrot, zucchini, pumpkin, green bean, and braised greens. ooops. Fiddleheads. Never tried them? Oh, you should, you should. Try this: Maine lobster, fiddleheads, and blueberry pie. Yeah, that's a meal. Spent much of the day writing more reiki test questions. Sister says, "This is a different kind of class. You shouldn't have tests." Co-workers say, "Reiki class? How can you make that academically rigorous?" I want to build a class structure that will endure, evolve, and accommodate large or small groups of students. I want to teach reiki. I want the students to learn reiki, communication, self-awareness, self-care, and more reiki. I'll use a variety of teaching and evaluation methods. I just want to do reiki. And light candles of reiki energy. Took the dog for a walk on campus. It's warm and sunny. The kids were wearing T-shirts & shorts, sitting on granite steps and green grass: studying, laptops, crocheting, and laughing. They smell fresh, like dryer sheets. The leaves aren't out yet, so the trees still look dead. There was one duck on the pond. The huge mounds of snow are melting, black on the edges and puddly bottoms. My daffodils are still blooming, but the crocuses have gone by. Will plant lettuce and peas this weekend. There's a plaza in Auburn. I went to a birthday party at a bar. Parked my car, walked to the bar. Walked past the river: fast and high. Walked past the plaza and there's this sculpture. It's mauve and pink tubes, twisted tubes, with lights on the ends. Are you picturing something organic and intricate? Something that stimulates your imagination and gets you thinking about sea creatures or or fireworks? Yeah. It's not like that. It's more like twisted light poles. Pink ones. Funny thing, it looked a lot prettier after the party. Spent much of the day writing reiki test questions. So challenging: make the questions unambiguous, not too easy and not too hard, focus on the important information. See if the student learned what he/she needs to know. I have 10 and I need probably 150 or 200. Maybe if I write 2 questions/day. If you were writing reiki test questions, what would you ask? Reading the 3rd book in Patricia Cori's Sirian revelations trilogy. Woke up at 6 and it was sunny! Fluff and I climbed a mountain. It was foggy up there. I ate a Cadbury egg on top, to celebrate Easter. On top was all granite, lichen, grass, and dripping conifers. Couldn't see the views: too foggy. Next we walked around the pond on campus. The gardens are clipped, raked, and freshly mulched. Ready for spring to spring forth. Then we found a new place, a path along the river. Thanks, Neil, for the directions. There was a sandy beach, driftwood, cliffs, and fast cold water. Does it feel like the world is in chaos? Find your center, a place of love & light. It's here! Reiki Nurse is now available on your iPad, iPod, and iTouch. Did you hear about the guy who foiled the attempted car theft? Yeah, I heard it on the radio this morning. Dude was sitting in Dunkin Donuts with his buddies. He's a tow truck driver, and his buddies are too. He sees a rogue tow truck, no sign, pull into a driveway. He approaches, they act fishy, they take off running and he chases them. He's running, on the phone with his entourage, they call the cops and join the chase. He gets tired, jumps in the cop car. They catch the bad guys. So all the tow truck drivers are like, yay! Girls start calling him Spider Man. He's on the radio. Just read The Porcupine House, by Andrew Flint. It is a beautiful, dreamy, poetic book. Booklet, really, it's quite short. Government speech or free speech? Can the state purchase art, and then display it in a closet? Or perhaps this is censorship. Can the Governor remove art because he doesn't agree with his perception of it's message? So far, yes he can. He said the mural supports labor, and he supports business. So the mural is gone. Where? We don't know, and we are the people of the State of Maine, the people who purchased the art. The case has gone to court. We shall see. Last night I finished a second edit on my new book. Today I took it to an editor in Paris, Maine. What a beautiful old town: gorgeous views of mountains, 200 year-old mansions, lakes and streams. I saw a pasture with a dozen llamas, a pottery studio, and the Celebration Barn Theatre- a place to study juggling, tumbling, and mime. Found a stream in my basement this morning. It rained hard last night, and the wind blew fierce. I have the wet vac, but haven't used it. Poured a little bleach into the stream and mopped it up. Set out on my adventures. First stop: the office for an hour of work. Had papers to grade. Then I enlisted the assistance of Myrtle, my GPS. We were off to Norway/South Paris: Myrtle, Fluffy, & me. We drove through small towns and bare woods. It seemed like we kept climbing. Suddenly there was the campus of a private school. Old brick buildings, a track, a modern building, and lawns. It was smack in the middle of frickin' nowhere. If I were a rich teenager from Massachusetts and my parents brought me here I'd be: NOOOOOOooooooooo! Help! I'm in the middle of frickin' nowhere!!!! There was a lot of flooding from the storm: ponds in yards and raging streams. I stopped beside a surging stream and took pics. The noise and power were overwhelming. I found Paris Hill: stunning 360 degree views of mountaintops, including the White Mountains of New Hampshire. There were old mansions. Again, in the middle of frickin' nowhere, this beautiful old settlement. Awful. I had lower back pain for almost 2 years. Hard to stand, walk, sit... OK, pretty much everything. Some mornings I rolled out of bed and crawled down the stairs, the pain was that bad. Tincture of time, gentle movement, ice, fab massage therapist, wonderful chiropractor, rest, muscle relaxants, physical therapy, reiki.... slowly it improved. I've been writing about it in my new book. Not sure of the title, any suggestions? PS: I'ts winter again here in Maine. Temp is 36F (2C) with a bitterly cold wind. Sky is overcast, gray. Crocuses didn't even bother to open up today: too cold. So I'm reading this mind-blowingly great book by Patricia Cori, called Atlantis Rising. She talks about the web of darkness and the web of light. The web of darkness mutes the natural vibration of Gaia, but this web is disintegrating. Fear + anger = darkness. Lightworkers are building a new web, a web of light. Love and laughter = light. Had big fun in Portland today. Went to a craft fair. An art fair, really. It was held in an old church, now taken over by artists. Kind of a sketchy neighborhood in Portland. Mixed industrial, retail, low income housing, and busy streets. But there's this undercurrent of coolness: a Vietnamese restaurant, funky coffee shop, and a pottery studio. And this church, taken over by local artists. The craft fair was here. I bought a switchplate with a zebra and splotches of color. I bought some herbal lotions, lip balm, and echinacea tincture. I bought some hand-dyed fleece. I bought a bib, sewed with vintage fabrics: friends are having a baby. Shhh! Don't tell them I bought this. The crafter said, "I hope they like it. If not, you can use it." Also saw boats and water. He has a new recipe. He's into sauces now, and cooks intuitively. I can't believe this dude, who ate only ramen noodles as a teen, creates these incredibly complex and original recipes now. He cooks for celebrities at the swankiest hotel in Portland, one of the coolest cities in the USA. He loves to cook. He wants to make people happy with his food. Ever read Like Water for Chocolate? Then I went to the Maine Mall and saw this. And that was my super fun day in Portland. The Big Thaw craft fair is today. I've been getting emails for over a month: beautiful photos and descriptions of the crafts and artists. I've seen exciting designs on cloth, paper, & metal. Creative, inspiring, & amusing. 10 Mayo St in Portland ME today. New flavor at Route 160 Ice Cream. People were grumpy today. Irritable, cranky, and angry. Good thing the dog had to be let out and the sun was shining. The grass is getting greener. The crocuses and daffodils are blooming. The wind was refreshing. Forecast for tomorrow: calm sunny happiness. A nurse came with me when I had to have a tooth extracted. I knew that if the oral surgeon had trouble getting in the IV, she could help. If I tried to die, I knew she'd revive me. I knew I was safe because that nurse was there. She drove me home after the procedure and tucked me into a recliner with an ice pack against my jaw. She was my guardian angel that day. I felt safe, cared for, and validated as an individual. I knew I could get knocked out, and she'd bring me back. I knew she was smart, capable, and compassionate. I trusted her with my life. I didn't even care that she laughed at me when I was loopy. I laughed too. A spiritual practice, a healing modality, energy work, self-care, beams of electricity, meditation, touch-prayer, or universal life force energy. Is it an external accessible force, or an internal relaxation process? 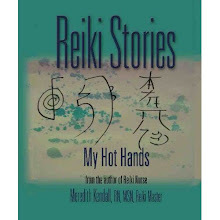 Here I am, doing reiki all these years, sharing reiki energy, teaching reiki, wrote a book about reiki; and I'm still not sure. What is it? Is it chanelling or meditation? Do beams of electricity shoot out the practitioners' hands? Not sure what it is or how it works. Not sure what language to use to describe it. It does work, I'm sure of that. People who share reiki energy see colors and shapes. They feel happy and relaxed. Pain lessens or disappears. Angels and spirit guides appear. We feel throbbing and pulsing and burning and icy cold. Stuff happens. It's amazing and I feel lucky every time I'm able to share reiki energy. What is it again? I don't know. Walked the dog on campus. This was the time I was supposed to be having lunch with my friend Karen, but I completely forgot, I'm so sorry! So I was walking the dog, oblivious to my friend waiting and worrying ("You never forget!" she said. ), obliviously walking in the sun and the wind. The ice is out on the pond and some ducks are back. I saw barefoot boys playing soccer on the plastic grass. I saw girls skateboarding and realized it's usually the boys who skateboard. Their legs were skinny, pale, and flawless: flying by. I saw mud spatters on the window of the pottery studio. There were origami cranes on the windowsill. I thought about my sister moving to China, my new nephew in San Diego, my nieces headed to China, a nephew in Australia. Did I think about my friend and having lunch? No. Sorry! If I write appointments in my calendar, then I'm good. This didn't make it to the calendar, and I didn't make it to lunch. The snow is almost gone from the backyard, just a couple of thin patches near the garage. The grass turned green overnight. Do you think we'll get more snow? Shouldn't write about this, shouldn't think about this. But there it is. The Italian Bakery. Their donuts are SO good. Someone brought in 3 boxes today, for a meeting of 24 people. You know you can't just look. If you look, the vision erodes your impulse control centers and stimulates hunger. You look, you're done. You're going to have one. What makes those donuts so good? They're soft, but crunchy. They're not too sweet, and no chemical aftertaste. The Italian Bakery is on Bartlett St in Lewiston. Those donuts are so good. So not good for you, but so good. That's right. The mountain of ice turned to slush and melted. There were patches of it this morning, now gone, revealing greenish grass, mud, rocks, and gardens. It's 65F (18C), robins are singing, people are riding bikes and walking dogs, crocuses and daffodils are blooming, and I'm sitting on my deck. What could be better than a spring evening? Celebrate books! Grab a book and turn to page 52. What's the 5th sentence? My 5th sentence: "This is the time for union." We're having a glorious spring day here in Maine. I've just come in from working in my garden: cleaning up twigs, trimming bushes, and spreading the snow piles around so they melt faster. 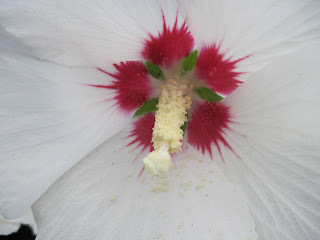 I moved the big hibiscus bush. It was buried under Slush Mountain, and too close to a path. I didn't know if the ground was thawed, didn't know if I could dig it up. It was and I could. Now the hibiscus is in a new spot with lots of room to spread out. I cut some big roots, I hope it will be OK; I gave it lots of reiki. Last summer it was covered with big white flowers: red centers and yellow stamens. Some teenage boys came by, collecting bottles & cans for their basketball team. Their coach was with them. I didn't have any bottles or cans, so I gave them some money and wished them well. I was barefoot and wearing muddy jeans when they came by, relaxing in the sun on the deck, reading a book by Patricia Cori. Spring is here and Slush Mountain is melting. Every afternoon when it softens up I shovel it, tossing ice chunks onto the lawn and gardens. Last winter I could almost walk from my deck onto the summerhouse roof; that whole area was snow and ice. Now the mountain is flat and disappearing fast. The lawn slopes downhill again. The first crocuses bloomed today, yellow ones. The daffodils are almost there. The maples are blooming. I sat on my deck today, feet bare, sunglasses: grading papers. I walked barefoot on the remains of Slush Mountain. Reiki helps me recognize the importance and value of self-care. I want to be as healthy as I can be: I want to exude health, love, and joy. Reiki helps me live in the moment, helps me check in with myself, and gives me access to a stream of amazing energy. Flint's writing is evocative, poetic, and hauntingly beautiful. His descriptions of skidder tires, walking in trees, and birch hooks drifted into my mind like a half-remembered dream. 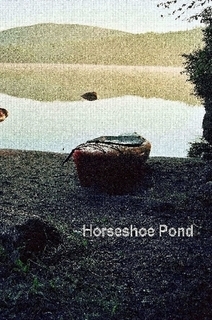 Highly recommend Horseshoe Pond by Andrew Flint. Like you taking some moments during a meeting to write a poem, I try to integrate self-care into daily activities. Taking my students to the 3rd floor of the hospital, I encourage them to run up the steps as I do: aerobic exercise. Waiting to get meds from the Pyxis I do a yoga forward bend. I plan and prepare my meals so I have lots of fresh organic fruits & vegies, beans, and grains. I make a phone call and get put on hold? Great! A moment to relax and reflect. Take a deep breath. Do a little self-reiki. By caring for myself, I'm better able to care for others. As you pointed out: I get to move up Maslow's hierarchy. When I have enough sleep, activity, nutrition, and social interaction then I'm better able to express my compassion for others. I notice I have more physical energy, hope, and mental acuity. Self-care and balance: key to my well-being and yours. Just got home from the radio station, was on for 1 1/2 hours this afternoon. It was Neil's World Music show, and he invited me to come and talk about reiki. So between songs we talked about reiki, yoga, mountain biking, volunteering, world music, writing books, squinty eyes, marine biology, reiki, kayaking, ostomies, the dog named Pi, and reiki. He called me his "Reiki Goddess." He played a song from the 70th latitude: barking dogs. He played contemporary reggae, bagpipes, African jazz, Hotel Catalano (maybe? ), and some Cuban Beatles. There were a LOT of CDs there. I got lost leaving the studio and wandered past rooms of CDs, all neatly labeled and shelved. There were 3 CD players, 2 microphones, and lots of lights and dials in the studio. I was nervous at first, and talked like a teacher. In the end I barked a little. Got my hair cut today. Not so good at commitment and making appointments, I tend to drop in. So I take who I get. Today I got the green lady. She wore bright green pants, a ruched see-through pale green top unbuttoned to there, gold necklace, and pearly green eyeshadow. Her hair was very blond and she was tan. Just back from Florida she told me. Orlando. And why doesn't she live there, she wondered. The weather. I mean, here we still have snow. There, it was 85 and she went to the beach. Population density, I said. Can park anywhere. Yeah, she said. And she's been cutting hair around here for 20 years. Her clientele. Go down there and get drop-ins like me, I suggested. She laughed. You're kind of a wash-and-go type of person, aren't you, she observed. My brother wrote a book! I read it last night. Horseshoe Pond, by Andrew Flint. It's beautiful, evocative of special times and places. It's about being a young man, about living in Maine. It's about logging and building a log cabin. It's about loving people and places. It's dreamlike and mysterious, like fog on a spring morning. I highly recommend this book. Click on this link to purchase Horseshoe Pond. It was sunny after work and my dog likes to go for a ride. I drove over to the campus. I parked, filled my pockets with keys, phone, camera, and plastic bag. I slid her collar over her head and we set out. The bag is in case she poops, as I am a city person now. City people pick up poop. Girls were running on the track, jumping over sawhorses. We walked past the gym, the hockey rink, and the bobcat sculpture. Guys were playing baseball on the upper field. Last week when we walked by they were shoveling snow off that field. More guys were playing lacrosse on the big field with the fake grass. We walked past the cafeteria, classroom buildings, and dorms down to the pond. We walked around the pond. It's still covered with ice. Melting snow uncovered squashed beer cans. A girl was sitting on a granite step, playing guitar. There was a blue shirt on the ice. Geese flapped high overhead. The sun was bright but the wind was cold. We headed back to the car. Two young women stopped. "Can I pat your dog?" one asked. "She's beautiful. I have a dog back home. I don't miss her so much, if I can pat a dog. I have a Shih-Tzu. The girl was wearing black leggings, white T-shirt, and a gold necklace with pink discs. Her skin was dark and smooth. She and her friend walked on. Another girl walked up. She looked about 6, and was with her dad. "Can I pat him?" she asked. She wore bright pink pants, a polka dot shirt, and snow boots. Her jacket was open and falling off her shoulder. "Palm up! Palm up!" her Dad said in a high fast voice. She let Fluffy sniff her palm, and then she stroked Fluff's head. "I have a dog," the little girl told me. "Oh, what's your dog's name?" I asked politely. "Pi," she replied. Her father smirked. It being the campus, I guessed before she clarified. 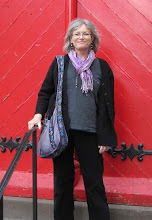 Went to dinner last night with Jeanne, a reiki practitioner. We went to the Thai place on Sabattus Street, The Jar Earn. I had a gift certificate from my students. When we walked in, a nice lady behind the counter seemed surprised. "You're here for dinner? To eat here?" She wore a pale pink linen blouse and black slacks. She was attentive. We were the only customers. Jeanne ordered spicy chicken pad thai, me: tofu mango fried rice. The food came in hot mounds on white platters. We ate quietly, chatting about reiki. A drunk guy came into the restaurant, shouting, "I LOVE YOU!" The woman behind the counter said, "You have to leave." "BUT I LOVE YOU!" He leaned over the counter. "But you have to leave. You know the owner doesn't want you in here." He was wearing dirty jeans and a jacket. I could smell the alcohol. He started to get agitated and I pulled out my cell phone. "SO YOU AREN'T GOING TO GIVE ME ANY FREE FOOD? BUT I HAVE MONEY! IF I BUY SOMETHING, CAN I STAY? I HAVE MONEY. DO YOU THINK I DON'T HAVE ANY MONEY? I HAVE MONEY." "But you have to leave," she repeated. He came over to our table. "ARE YOU DECENT PEOPLE?" he asked. Jeanne and I stopped eating and stared at the table. The drunk guy left the restaurant shouting, "I LOVE YOU!" I watched him out the window. He lurched through traffic into the bar across the street, The Blue Goose. Reiki is a combination of a gentle touch and the opportunity to relax. In my experience, most recipients of reiki report feeling calmer, more comfortable, and happier after the session. With reiki, I find it is just as good to give as it is to receive. I encourage you to try a session or take a class and learn how to do it yourself. These are some top searches. I've seen pics of Nicki Minaj: creative dresser. But what's a friv and what's a myxer? Well check out friv.com and Easy Joe. Cute and fun. Friv has tons of games. Now, what's a myxer? Ah, site for ringtones and wallpaper. All set. It's here! Spring is here. There's a flock of robins in my burning bush, eating all the berries. Hey! Had brunch at Cyndi's Dockside in Poland, Maine. Had the famous Crab Cakes Eggs Benedict with sweet potato fries, only 100,000 calories. The restaurant is located on Range Pond. We sat beside the fire, a real fire with real logs. The dining room smelled woodsy and was pleasantly warm on this sunny but cold morning. The fireplace was granite. Cyndi herself came to check on us several times. I had a nice visit with an old friend, another reiki practitioner. Then, since I was in the area, I went for an adventure. Drove up to the Poland Spring Museum. It's located on top of a hill in Poland. There were snowy fields, woods, beautiful old buildings, museums, a gazebo, and the original spring house. The place was deserted; Fluffy and I wandered around admiring the views. I could see Mt Washington in New Hampshire beyond the gazebo. I peeked into the spring house and got spooked by a nursey maniquin. "Sapientia Donum Dei" is the motto of the Ricker family, founders of Poland Spring Water. It means "Wisdom, gift of God." The Rickers built an inn, then a resort. It was a healing place, with the mineral waters and a staff nurse. Now Nestle owns the business and sells the water. Water is pumped from all over Maine now, not just Poland. We do have good water here in Maine. The wind blew us around a bit, but the sun was great. There are hiking trails up there, maybe we'll go back later this spring. Listening to Toro y Moi, psychedelic melodies, low-fi chill. Perfect music for dreaming and writing. Not much to do outside: no shoveling, no mowing, no gardening. It's good walking weather, Fluff and I will do that in a bit. Also good weather to write and edit. Not too cold for my writing porch. Just right. Fluff and I are going to walk along Range Pond today, catch some Vit D and cosmic energy waves. Or particles. They could probably be both, or either. Depending on what you expect. See? Told you Toro is good for dreaming. Yesterday we had a big wet snowstorm; 10 inches of slushy snow. Today it was 50 degrees and I took the dog for a walk. We walked around the pond on campus, to see what the melting snow revealed. We saw soggy gloves and socks, crunched beer cans, and food wrappers. I heard a loudspeaker and cheering, so we walked up the hill to see what was going on. Found a lacrosse game. How did they get the field cleared off so fast? It was sunny, but there was a cold wind. I wore winter boots, jacket, wool scarf, and gloves. These athletes were running around in short sleeves and bare legs! Spectators were huddled against the wind, shouting at the refs and cheering the players. The women wore goggles and mouth guards, which gave them kind of a spooky appearance. They ran around with their sticks in the air, and sometimes fell and rolled on the ground. Sometimes they clicked their sticks together. They whirled the ball through the air and scooped it off the ground. They smacked or bounced it into the goal. Home team won: 12 to 7. People keep asking for my next book. Someone asked to edit it. The requests and messages have really piled up lately. I finished it last fall, and did some editing over Christmas break. Now it's April. I'm editing again, and meeting with an editor in 2 weeks. I waited. I wanted some time to pass between writing and editing. Publishing and selling a book is expensive and a lot of work. Once I send it to be published, I know all that marketing has to be done. So that's held me back. But now, now seems the time to go forward. It's cold but sunny. Sunshine is streaming in the windows, and reflecting from the snow onto the walls and ceilings. Snow is falling from tree branches and turning to slush on the driveway. I'm sitting in my porch office, windows all around; lots of light. It's a good day. A good site to write. In the light. New post: new snow. We got about 10 inches yesterday. It was wet and heavy, the temps right around freezing. I heard snow thunder down the roof in the night. Icy chunks slid down the metal roof and crashed into the snow below. This morning the branches and eaves are dripping with melt. The air is fresh, the new snow a pretty ground-cover. Daffodils valiantly poking above the blanket of snow, striving to open their yellow faces. Just when you were thinking of daffodils and gardening. Just when you could sit on the deck again on a sunny afternoon. Just when you put away the salt and shovels. Another storm. A good old Nor'Easter. We're getting wet heavy snow, perhaps a foot. It's sticking to every branch, every mailbox, outlining every detail on my summerhouse. It's pretty.